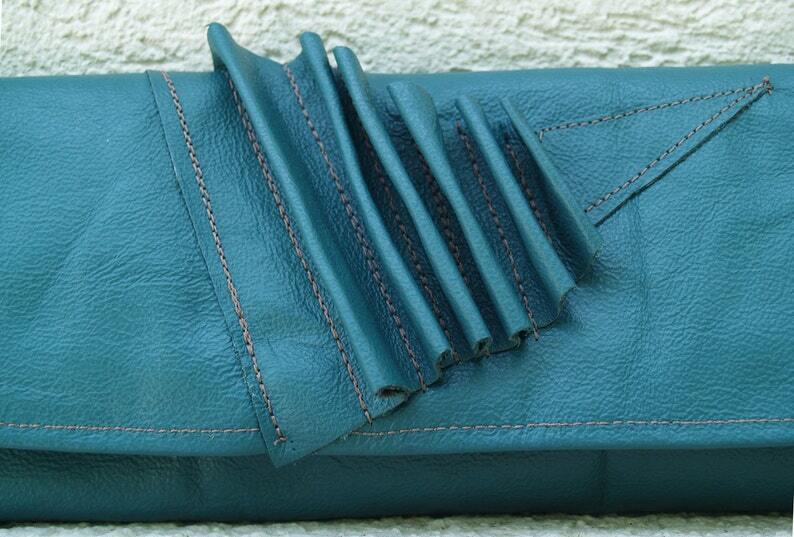 A beautiful teal/turquoise leather wristlet, it's long and lean. Perfect to accompany you to any occasion, evening or casual. It's accented with an abstract brown and teal leather design on the flap, and brushed silver handware. A metal snap and sew in commercial grade velcroe will secure your contents A custom, one of a kind design, this handbag will add spice to any accessory wardrobe. Additional teal turquoise leather accessories are available. Dimensions of this wristlet are, length 13", height 4-3/4"; Divinely inspired.